Earlier this year, the Washington, D.C. Public Library announced that Martinez+Johnson and Mecanoo had won their competition to design the next phase of the city's Martin Luther King Jr. Memorial Library. Check out AN's coverage of the winning design here. 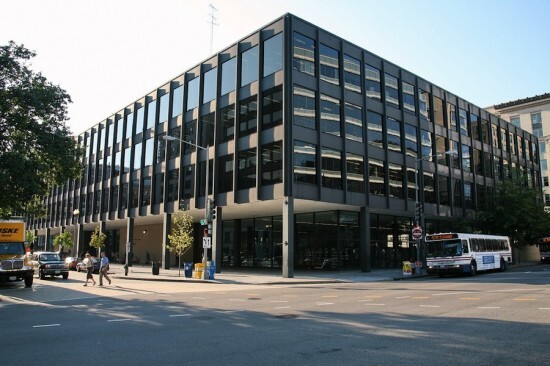 The firm beat out two other finalists to revamp van der Rohe's iconic work. Here's AN's guide to the competition and the runners-up. 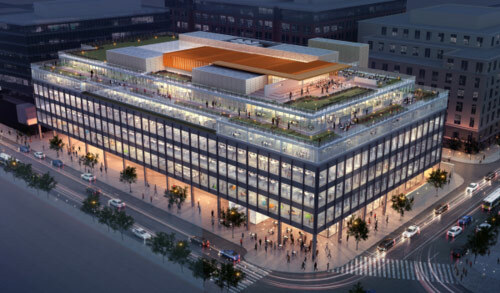 According to a press release from the D.C. Public Library, each team “developed two preliminary design ideas: one of a stand-alone library and one of a mixed-use building with additional floors.” All three teams propose ways to respect and restore the structure’s original facade, but re-imagine the library’s interiors and offer ideas for what can go on top of it. There are also two competing proposals to add “a cloud” into—or onto—Mies’ structure. The Runners-up: The Patkau Architects/Ayers Saint Gross proposal removed existing interior floorplates to create what they’re calling a “Community Mixer.” Above this courtyard-like space will be “the cloud,” a “new technological form” that “distributes daylight, broadcasts information, and sustainably generates energy.” The STUDIOS Architecture/The Freelon Group team proposed a completely revamped roof with gardens, a café, a pedestrian walkway, an amphitheater and possible housing. And, yes, they’ve got “a cloud” too; it will be “ever-present through the building” and include “new library programs associated with sharing, innovation and prototyping.” Martinez and Johnson + Mecanoo's winning proposal: Read about the winning plan in AN's recent article on the project. Out of a crop of 26, ten teams have been invited to present their technical proposals for the renovation of the Mies van der Rohe–designed Martin Luther King Jr. Memorial Library in Washington, D.C. District officials are hoping to transform the landmark 1972 building, Mies’ last built work and his only in D.C., into a state-of-the-art central library fit for the nation’s capital. The finalists are Cunningham Quil Architects and 1100 Architects, Ennead Architects and Marshall Moya Architects, Leo A. Daly and Richard Bauer, Martinez and Johnson Architects and Mecanoo Architects, OMA and Quinn Evans Architects, Patkua Architects and Ayer Saint Gross, REX and Davis Carter Scott Architects, Shalom Baranes and Davis Brody Bond, Skidmorw Owings & Merill, and Studios Architecture and The Freelon Group. With the library’s plumbing, HVAC and elevator systems in need of replacement, asbestos present throughout the building, and annual maintenance costs soaring to $5 million, the aging athenaeum demands some serious work. Library officials have given their chosen architects a few different options, from a simple update of the building’s ailing systems, to construction of two additional floors or a complete gutting the interior. Either way, the transformation is scheduled to wrap up by 2018. 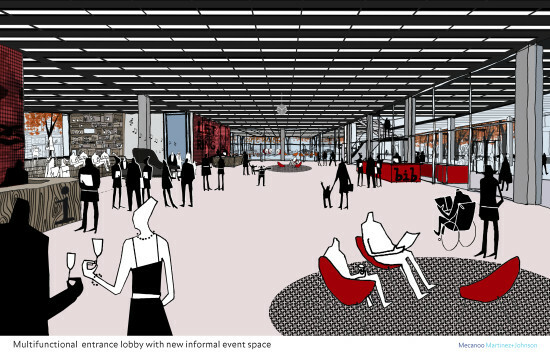 The Freelon Group showed off renderings for their renovation of Mies van der Rohe’s Martin Luther King Jr. Memorial Library in downtown Washington, D.C. Presented to the library’s Board of Directors as part of a long-running discussion over what to do with the central library, the scheme includes a four-story atrium, two additional floors for new tenants, a landscaped public roof garden, and a new ground-level café. According to developer Jair Lynch, the project would cost $175 to $200 million.